What CallHub Triggers and Actions are Supported? New Press-1 Lead - Triggers when the transfer digit is pressed for any voice broadcast campaign in your CallHub account. New Voice Mail Received - Triggers when a new voice mail is received for any phone number in your CallHub account. 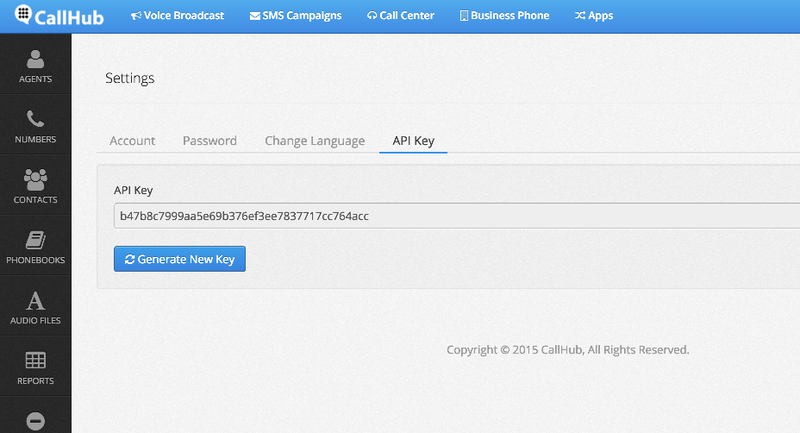 New Text Message Received - Triggers when you receive a text message for any SMS campaign in your CallHub account. New Note Added - Triggers when a new note is added by an agent for any call center campaign in your CallHub account. New Agent Activated - Triggers when an agent activates his account to make calls for call center campaigns in your CallHub account. Create New Contact - Creates a new contact in CallHub. Create New Agent - Creates a new agent for call center campaigns. 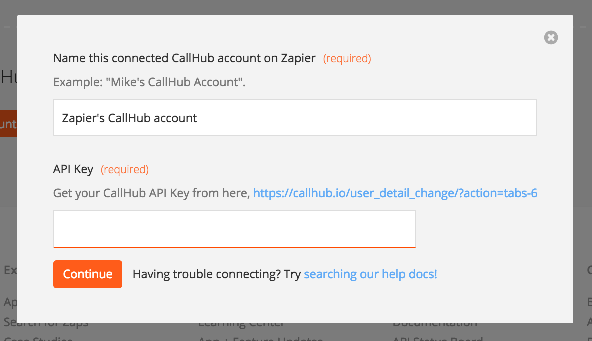 The first thing you'll need to do is connect your CallHub Account to Zapier. After you sign up and start creating the Zap you want, Zapier will ask you to start the process. You can then give your Account a title or label, which is just for your convenience and helps you identify the appropriate CallHub account inside of Zapier. In the photo above you should see a link to the CallHub settings that will show the API key, which looks like the below. Just copy the API key into the popup back at Zapier and click the continue button. You can! You'll need to configure Zapier to add the contact to a phone book that is currently assigned to a running CallHub campaign. The contact will then automatically become part of the running campaign. An account in CallHub must have a unique set of phone numbers. Check if the phone number of the contact already exists in your account.